Solid Builders is a locally owned and operated residential construction company specializing in home remodeling and new construction. Based out of Cary, NC, the business was formed in 2003 by Aaron Miller. He has 18 years of hands on experience and is a licensed General Contractor for both residential and commercial building. 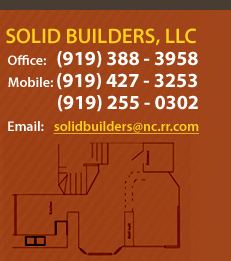 Serving the Triangle area, Solid Builders offers a full range of remodeling and construction services included but not limited to renovations, additions as well as interior and exterior home improvements and repairs. 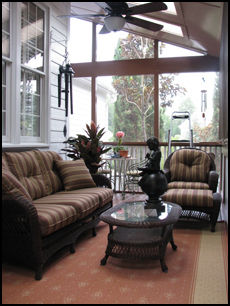 We will give your property the added value, beauty and functionality it needs. Solid Builders is small enough for the personal touch and large enough for you to be confident the work will be done in a timely and professional manner. Our number one priority is our customer�s satisfaction and we achieve that through quality craftsmanship and first class service.